Hollybeary Creations : NND Release Day 3 !! NND Release Day 3 !! 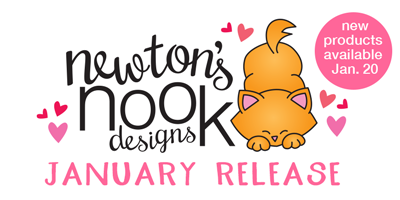 We are half way through our release day previews at Newton's Nook and you will love today's set. 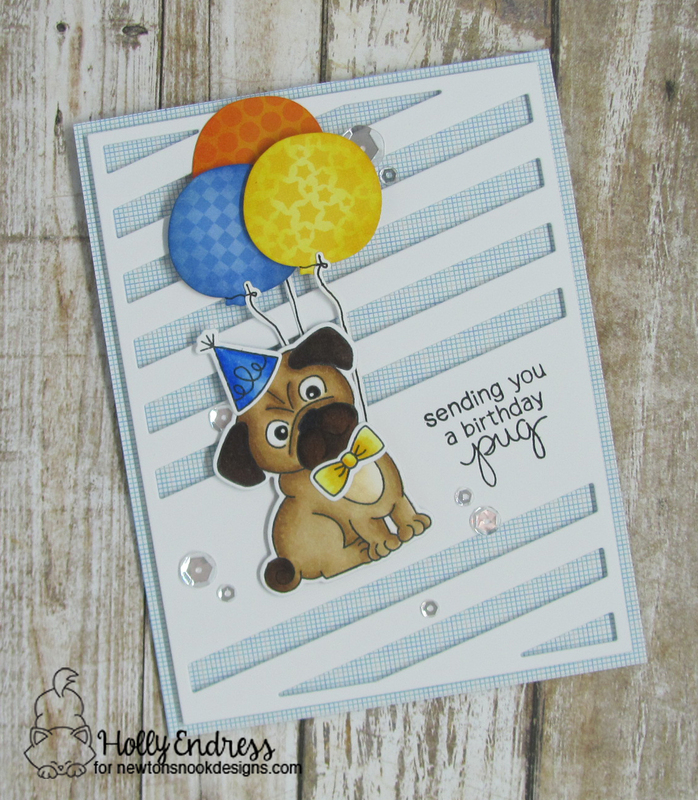 Today we are showcasing the new set Pug Hugs...Who doesn't love a Cute Pug? I used some pattern paper to create a background that would show through the die cut panel. Then I colored the Pug image with Copic Markers and his little accessories in coordinating colors to match the pattern Paper. I die cut some Balloons from the same papers to match as well and added some distress inks to the edges. I stamped the sentiment on the die cut panel and adhered it to the card front with some foam adhesive. I die cut the pug image and adhered those and the balloons with some liquid glue. I used a die cut for the Ballon strings and I drew the strings into the die cut shapes. I wanted a little sparkle but nothing glittery so I added some Sparkling Clear Sequins. So cute!!! Would you like to win the “Pug Hugs” Stamp Set? This set will be given away to ONE lucky winner! Comment on the NND blog and Design Team blogs (see list below)! The winner will be chosen at random from the collective reveal posts. Make sure to check out each of their blogs and comment for your chance to win. You will not know which blog has been chosen so the more you comment on the better your chances are of winning! You have until Thursday January 19th at 9pm CST to comment -- winners will be announced on the blog post on Friday, January 20th. What a fun and cute design! Looks really amazing! Awww!!! The sweetness of the pug!!! Your card is absolutely adorable!!! This is really cute! I love how you created the background too! So cute. Love the colorful balloons and the background for this adorable pug. Very cute card :) the pug hugs is such an adorable stamp set!! Thanks for sharing. Love that you used the die cut panel. It really adds texture to your great pug card. Balloons = Party! to sit and hold his balloons. Such a wonderful card design!! Love how you've done the background and your coloring! Grest colouring pug..love the card design. Adorable. 💕 Great colouring and I love the die cut background. Love that you added a fun background and the cute balloons. 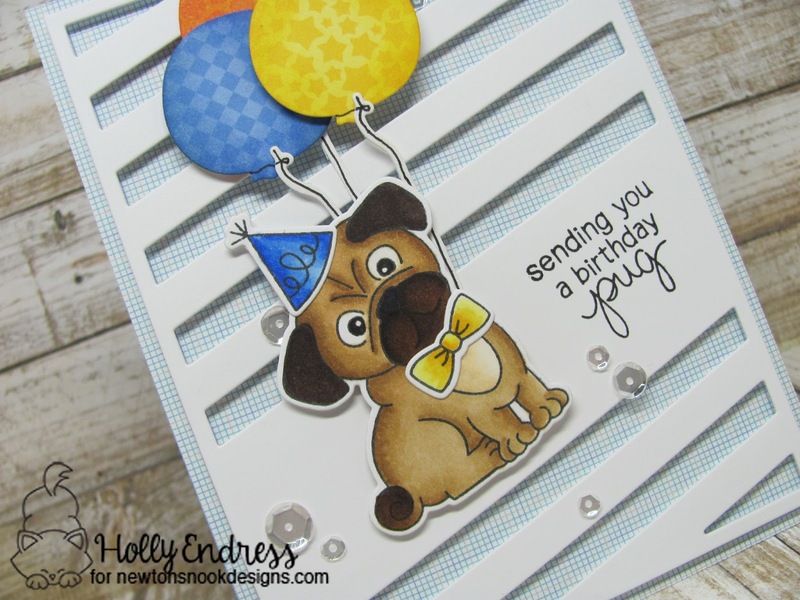 Love the pug card and your design! Your card is too cute! I love your background and the added pop of color with the balloons! Adorable card! Love those colorful balloons and that cute pug! Fantastic card! I love the cover panel you used and the balloons are just a fun accent!! The colors are so cheerful and perfect for a birthday card. Awwww, so cute! That pug's expression is priceless. My niece has a pug named Princess - I've seen that face on her precious Princess. I love this card....the balloons are the perfect addition! Great birthday card, love the little party hat on the pug! Great card! I like the die cut background and the sequins. Oh too cute! Love the balloons! Another cutie. Love the balloons in paticular. Love the tone on tone of those balloons. Cute, cute, cute. I love this pug's expression, like What are you doing putting that hat on my head. Love it. Too cute! Love your coloring! Stunning card! I wish I had my birthday right now. It's just beautiful designed! Awww, what a sweet card! Love the design with the patterned paper peeking through the windows and the fun colorful balloons! Love the colorful balloons and the pug. He's very cuddly. The die cut background really sets it off. Love your coloring and design of the card! This card is fantastic. Very pretty. 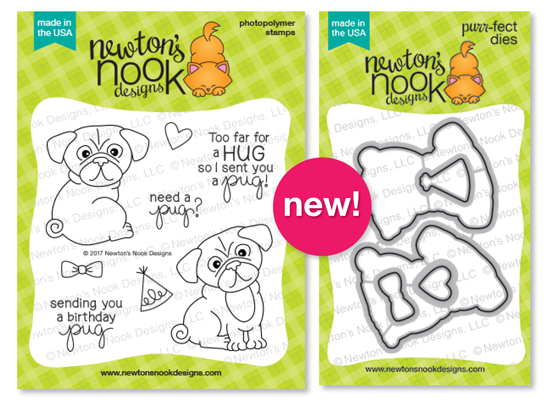 I love Newton's Nook for all of their wiener dog stamps and dies, but this pug is adorable! I really love how you created this card. Using that background die and the paper behind it really makes the cute little Pug the center of attention. The balloons and sequins are the perfect finishing touches. This is a cute set and the card you made really brought that out. Love the way you colored and the designs on the balloons!